Congratulations on wanting to form your own business! Entrepreneurship is the surest way to use your own talents to improve society while growing wealth. Starting a business is regulated by multiple levels of government. It is irresponsible (and illegal!) to operate a business without following those laws and regulations. It is not difficult to get the ball rolling, but there are many considerations and forms to address. So it is wise to get the basic decisions and legal steps out of the way well before you want to start doing business. That way, when an opportunity for your business idea presents itself, you are ready to pounce on it! Argent Place Law does more than merely create paperwork for legal filings, the Firm is dedicated to making sure the you understand what is required to start your company right, operate it successfully, grow its value, and ultimately exit in a manner that satisfies you. Here are six issues that are important to understand before starting your company. State registration is not required. However, most businesses must register at the local level (in the county or city where your business is located). Personal social security numbers may be used to open a bank account or file federal tax returns with reference the company. A separate Employer Identification Number, or EIN must be obtained if employees are hired.Sole proprietors are personally liable for everything the company does, including the actions of employees. This puts at risk entire personal savings and privately owned assets such as a house or car. Check with your insurance agent to be certain they are willing to cover the acts of your employees in your personal liability or umbrella policy. Only the company’s assets can be used to pay creditors, including creditors who have won a lawsuit against the company. So the personal assets of the owner(s) are safe; they can be attacked only in extreme cases, which is called “piercing the corporate veil.” Fraud by the owner(s) is probably the most common reason to pierce the corporate veil and attack the personal assets of the owners of a registered form of business. Once you decide to limit your personal liability by registering your business with the state, you have basically two forms to choose from: Corporation or Limited Liability Company (LLC). Each form has its place. See the FAQ section of this website to learn more about why you would choose one form over the other. Both LLCs and Corporations must file Articles with the state in order to register. You must also register in the county or city where your business is located in order to do business there. LLCs may have Operating Agreements and Corporations may have Shareholder Agreements to govern the specifics of their relationship to one another. Unless there is such a written agreement among the owners, your relationship is governed by the laws governing Corporations or LLCs within your state. Corporations generally need Bylaws to specify the procedures for governing the Corporation. Those details are contained in the Operating Agreement of an LLC, which does not have a separate Bylaws document. Step 2:Register with state and local governments and the IRS. All business forms except the Sole Proprietor and Partnership must register with the state, and pay fees to the state. Most businesses must also register with the local government to get a license (and pay local taxes). You need an Employer Identification Number (EIN) from the IRS in order to open a bank account in the name of the company, whether or not you have any employees. Step 3: Have an agreement with your partners on how to run the company. The partnership agreement (also called an operating agreement or shareholder agreement) is critical. Among other things it should include a buy-sell agreement. Step 4: Decide how you pay income taxes. 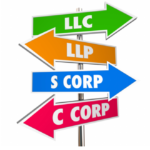 LLCs and Corporations have the option to be taxed on income at the federal level in a special way called an S-Corp. Companies that choose the S-Corp election do not pay income taxes directly, rather all the company income as allocated to the owners who pay the income tax. Step 5: Think about registering to use a fictitious name. Fictitious names are also known as the DBA or “Doing Business As…” name. For example, “Robert Sandborne Plumbing, LLC” may advertise as “Famous Bob’s Plumbing,” but only if a fictitious name is registered. Step 6: Protect your intellectual property. Stop and apply for a trademark on your company name. The application process also confirms that you are clear use use the name you have chosen. Other proprietary ideas should be protected as trade secrets or patents, and creative work such as software or graphical design, photography, or literary works should be copyrighted. Convert to LLC or corporate status when the entrepreneur is ready to do so. Draft Shareholder Agreement or Operating Agreement to govern the relationship among the owners and largely supersede the default laws governing corporations and LLCs. Help create and protect internal processes that form the basis of your competitive advantage (your Intellectual Property). Draft and review the various kinds of contracts you will sign or create, including lease for space, contracts with vendors, create a template contract for customers, letter offers of employment to prospective employees, and contracts with key employees. Careful consideration of registration options to best fit your individual and the company’s needs. Complete contracts and processes allowing for better business operation. Why register with Argent Place?